It was damn cold at 0530 when DJ Shadow’s “Endtroducing” woke me from the depths of my sleeping bag. Well into the second verse, which illustrated why I’ve never been able to use the alarm on my watch. Little Bear sighed his squeaky baby sigh, bundled in his sleeping bag in between us. Worried that my absence would more directly expose him to the cold gusts coming in under the tent edge, I tucked my sleeping bag close to him and draped it over his legs before carefully and quickly exiting, every finger and toe attuned to waking neither my wife nor my little son. Outside it was far too cold for hanging around and making coffee, so I grabbed my pack out of the car, loaded my rifle, and got walking, still in my big coat. The moon was more than adequate for a mile of road walking, but it was Sunday of rifle opener and the wall tents across the meadow were all already illuminated, generators thrumming but muffled by the wind. I flicked on my headlamp to keep from being run over. I had been up the trail before, and lost the bottom section through the grass, sage, and cobbles in a controlled manner, sweeping far right so I could know where to refind it once the canyon began to pinch down. I lost all moonlight in the depths, and took my time, walking to stay quiet and not sweat. In the upper reaches I switched my lamp to red, to better stay stealthy, but the feeble red light did not serve me well stumbling up through a steep sage field, and I wondered if the stronger white light would have served me better. In either case, I made it to the saddle before first light, and settled down in all my layers to wait until the binoculars mounted to the tripod in front of me would become useable. Montana does an exceptional job of providing for hunter opportunity, and with a little research one can uncover an almost confusing range of buck, doe, bull, and cow tags available either over the counter or with very favorable draw odds. 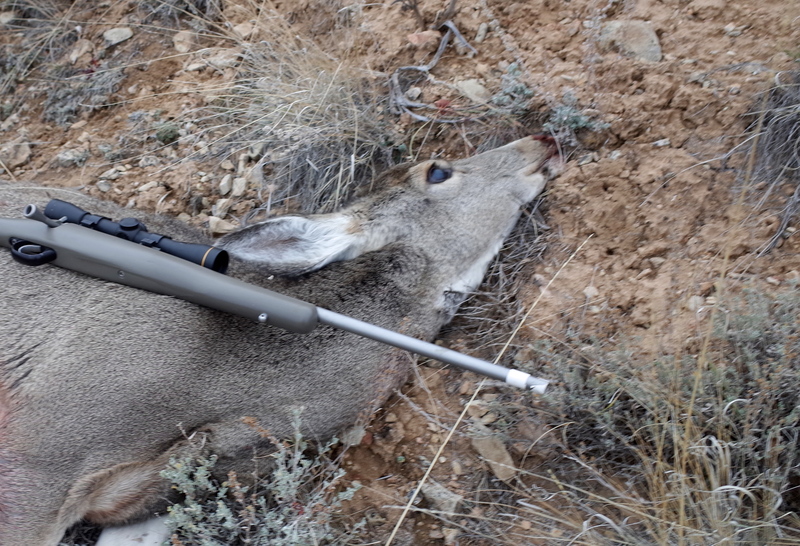 Most are surely meant for population control near highways and agricultural lands, but many give one leave to hunt deer or elk in some pretty wild and fairly remote, or at least overlooked and untraveled, country. I actually had four different tags in my pack I could use that morning, and when a half hour of glassing revealed a doe, and then two more, amongst the brush across the canyon I was faced with a dilemma. This particular doe tag could be probably be reliably filled on a trip we’d be taking in a few weeks to hunt a cow elk tag several ranges over, and something more rarefied than a deer might appear at any moment. On the other hand, M and Little Bear were waiting down in camp on a morning which was not proving to be as warm as anticipated, and what little mammalian life these hills held was probably pretty reticent, especially on opening weekend. I had done my homework and, with no coffee, made it up into position in time to calmly watch all three deer get up and start feeding, my head buried in a hat and two puffy hoods, my eye glued to the spotter at 30x magnification. There was no cover taller than my knee between me and the deer, but the wind was steady up canyon and I was far enough away that a backwards crawl out of sight seemed probable. It worked, and once out of sight I took off up the steep hill towards the rim. I’m fat and in bad shape at the moment, but know myself well enough to pound out a satisfactory ascent just fast enough to not make my rifle shake should a shot need taken, now. Towards the top I ditched my pack and crawled, rifle in hand, binos on my chest over the edge of a craggy knob. The deer were still up and feeding, moving steadily but slowly away. The wind was strong enough to be constant, but not enough to push a bullet too much at the modest range which should be possible if the deer kept feeding below the next high knob. Things looked ideal. Good conditions created by a long cold walk in the dark are not something to think about, but something to act on, and I edged back out of sight, grabbed my pack and hauled the last hundred feet to the ridge faster than before. Dropping 20 feet down the other side to allow for no absolutely no chance of being skylined, I moved along at the fastest walk possible, forward to the notch I had marked in my mind. Moving close to the edge, I selected a notch in the rimrock which would allow me a view below. No deer in sight, but that pointed toward two possibilities, either they had spooked off entirely, or were feeding below the rocky knob 200 feet lower. Caution remained second behind action, and I threaded my way down the cliffs and sage fields towards the knob. I put my pack down, chambered a round, flicked on the safety, and crab walked sideways to the edge. There they were, one doe plain as day 100 yards below me, the other two partially obscured further right. I took off my hat to pad the edge, and reminding myself to take my time, scooted left and folded it in half to achieve an ideal position. Reclined, with both elbows anchored on the ground and the stock pushing my hat into the rock, my brain turned off. 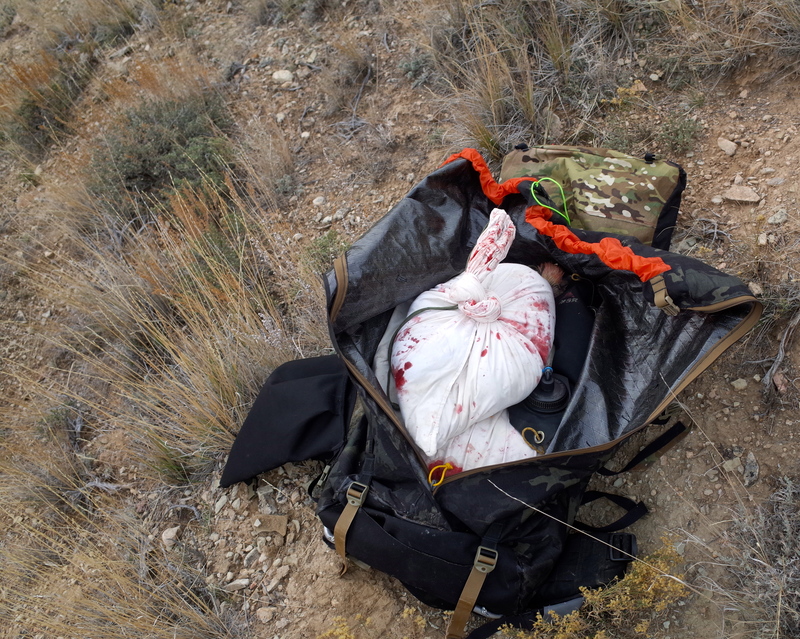 Apparently I’ve done enough field practice that this last part isn’t subject to much conscious thought any more, and soon enough the safety was thumbed off, the deer bucked hard, and a roar echoed back from across the canyon. The doe ran one way, then the other, stumbled, and disappeared from sight. Collecting my pack and chambering another round, I headed down to where I had last seen the deer. Before I got there I saw abundant blood splashed over the dirt and rocks, every 3 to 5 feet. Then more blood, bright and thick, and then a dead deer crumpled in the short brush on a steep hillside. It had come to rest in an old animal bed, providing just enough purchase my both it and myself. I had left camp in the dark barely three hours before. Gladness overwhelmed me. With grocery stores and well employed parents Little Bear will not go hungry, but the abstract question of can I feed him myself, now, made hunting very immediate lat fall when he was little more than a zygote, and even moreso now that he is three months old and food beyond milk is on the horizon. All of which made an hour of butchering and the five mile walk out very happy indeed. I still have a lot, lot, to learn about hunting, but I think I can justifiably attribute these venison packages to planning and skill, rather than just luck. And that is something to celebrate. Local, organic, and grass fed food on the table for your family. Sorry, anti-hunters but this has nothing to do with that lion everyone was talking about last summer. Hoping Nov isnt too dry. Congrats! And not only for the meat but for the knowledge and skills gained. I’m still only getting started, so much to learn. Had backstrap with gravy made form onions and dark lager the other night. A good way to go.